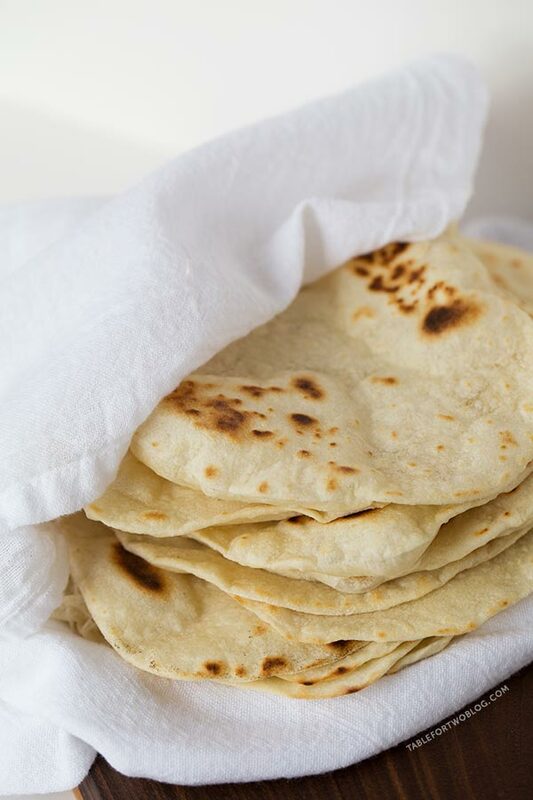 If you’ve never made homemade flour tortillas before, you’re missing out on the softest and most tender flour tortilla you’ve ever had in your life! I can’t go back to store-bought tortillas now that I’ve made my own flour tortillas! These are truly the softest and most tender flour tortillas I’ve ever had. I never truly thought to make homemade flour tortillas because it’s just so much easier to pick up a pack at the store when you’re in a pinch. Of course, that’s where you sacrifice quality, right? Convenience sometimes is greater than quality though but if you have the time, I implore you to make these homemade flour tortillas! You may never want to just “run to the store” for them again! I feel like any Mexican dish would be elevated to the next level by using homemade flour tortillas. I don’t ever want to buy store-bought again. Next time, I’m going to make a large batch of these homemade flour tortillas and then freeze them! If you use gluten-free flour, yes. Can I make this with a hand mixer or use my hands? Yes, you can use either but I would say a hand mixer might not work as great as your hands! Can I substitute the oil for lard or another fat? You can but make sure it’s measured melted. My dough keeps shrinking when I stretch it. Let it sit out at room temperature longer. How long are these good in the refrigerator? Definitely at least a week and max of two weeks. How would I reheat them? Put them on a plate and wet a paper towel, wring it, then cover the tortillas when you reheat them so they don’t dry out. Or you could use gentle heat in a toaster oven to reheat them. Can I sub out the flour for cornmeal to make corn tortillas? I honestly haven’t made it that way before so I’m not sure if the consistency would be right and whether or not they would actually form a dough. Yes, they would do well frozen and to reheat use a toaster oven or gentle heat in a skillet. Pretty sure when you make these yourself, you won’t ever want to go back to those store-bought kind. They’re just not the same. Trust me. Homemade flour tortillas are the way to go! 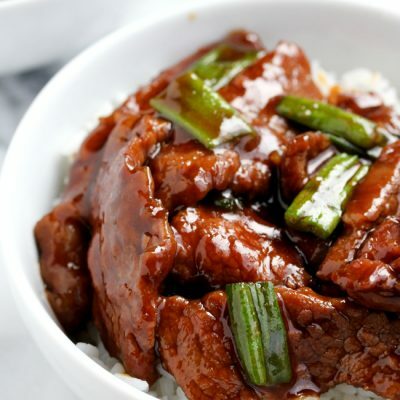 Fluffy, soft, and tender; these are definitely 100 times better than store-bought! In the bowl of a stand mixer fitted with the dough hook attachment, add flour, salt and baking powder. Mix on low for 30 seconds until dry ingredients are incorporated. With the mixer running at medium speed, add the vegetable oil and warm water. Continue to mix on low until mixture starts to come together and starts to form a smooth ball. Transfer dough to a well-floured surface and divide dough until you get approximately 16 fairly equal portions then shape each portion into a ball then gently, using the palm of your hand, flatten out the dough. Cover flattened dough with a clean kitchen towel and let rest for 15 minutes before proceeding. After dough has rested, heat a non-stick pan over medium-high heat. Roll each dough piece into a 6-inch diameter circle on lightly floured surface with a lightly floured rolling pin. Do not stack uncooked tortillas on top of each other. When the pan is hot, place one dough circle in the middle of the pan and let cook for 1 minute OR until the surface of the dough starts to bubble and the bottom starts to brown. At that point, flip it and cook the same way on the other side, but for slightly less time, 20-30 seconds. You want the tortilla soft and to have little brown spots on it. You don't want to cook the tortilla too much that it becomes crispy. Place cooked tortillas on a plate. You can stack them on top of each other to cool. If you're freezing them, wait til the tortillas are completely cool before storing them in a ziploc bag. If you using them immediately, go for it! I have the same thing with House of Cards. It just doesn’t work for me. And tortillas – I am honestly planning on during them for over a year now. And then I keep forgetting. 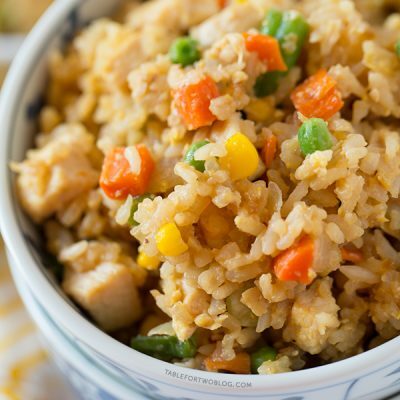 I am pinning this recipe so I won’t forget to make it this week. I live in Berlin, where you can see tortillas everywhere around and it’s so easy to buy them. But homemade is always better. 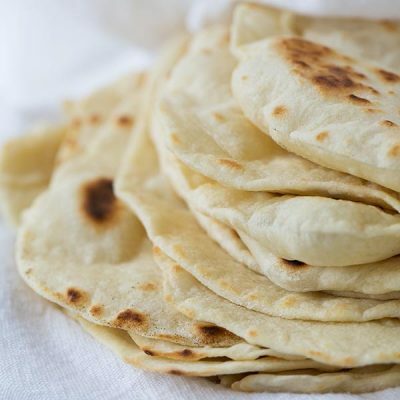 I love homemade tortillas, and yours look absolutely perfect!! So fluffy and decadent, I need them so bad! PS. House of Cards, no way. I tried and I can’t even. His fake southern accent? ugh, gross. I’ve now made corn tortillas twice and both times failed miserably. Maybe I should try flour ones instead- these look SO good! I love House of Cards but I can see that it’s not for everyone! OMG. these tortillas Julie- I have made them homemade before- but it has been years and years. I will have to go that route again! As for House of Cards- I still haven’t seen it- but my goodness people are obsessed! I’m the same way with shows. Everyone and their brother loved Breaking Bad. I watched about 8 or so episodes and hated it. I watched one episode of Scandal and was bored, but I may give it another chance. It’s funny how tastes differ. I am stoked about the show Resurrection coming up, but I saw on Twitter where some folks thought it was creepy and they absolute wouldn’t watch. I’m the weirdo! I really want to make homemade tortillas! You make it sound so easy! I love homemade flour tortillas! You are correct once you make them at home there is no going back! 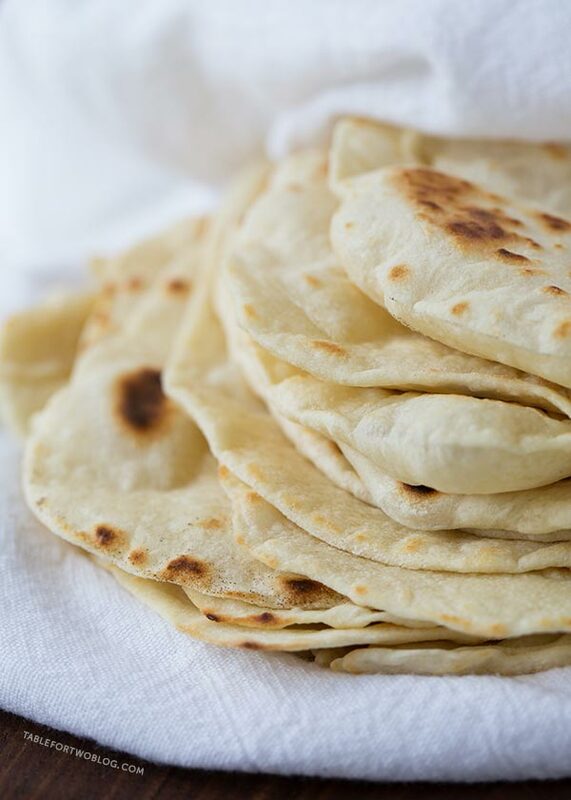 I’ve never made my own tortillas but now I know just where to start – these look incredible! Is it baking powder or baking soda you use? These look delicious – I’ve had freshly made tortillas at restaurants, and tender is exactly the right word. I’m going to love making my own! Love this recipe, Julie! I need to make homemade flour tortillas soon. I’m not into House of Cards (never watched it and hardly ever watch TV), but people do become obsessed with their favorite TV shows! So sorry Downton Abbey didn’t catch your fancy. I think for some of us, we are fascinated with the era and did not mind waiting during character development. Thanks for sharing! 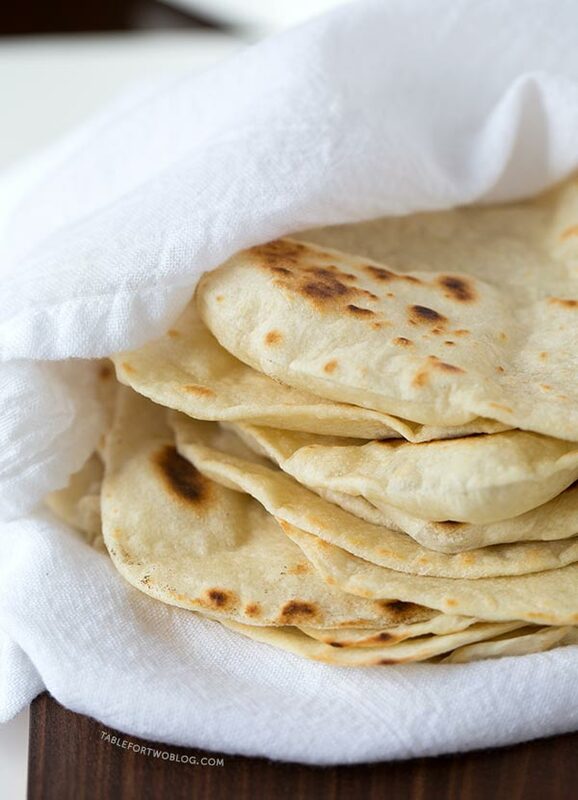 Homemade tortillas simply cannot be beat. Yours look perfect!! Yum I can’t wait to try these, they look super easy too! I love making homemade tortillas, I especially love eating them when they are warm! 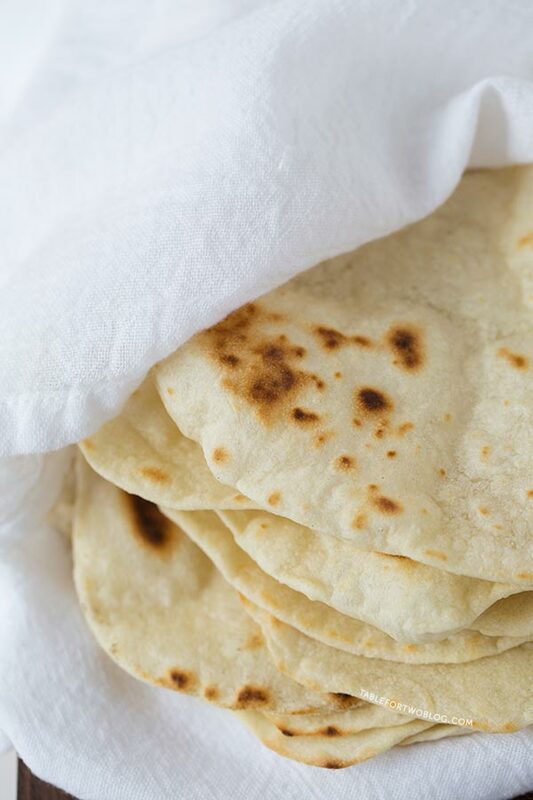 I’ve never made homemade tortillas, but these look so fluffy and soft – that it really makes me want to try it! These look like a stack of down comforters. I want to wrap myself in one they look so amazing! It’s funny because I hate politics but love political shows like The West Wing and Scandal. All of my friends have been pressure HOC but, like you, i need to be hooked pretty quickly. These tortillas look so tasty! It’s about dang time I make my own because I hear they’re amazing. Pinning and making soonest! For as mush as I make Mexican and food using tortillas you would think I would be making my own by now, but no. Now it is time because these look so good!! Homemade always rules! We have house of cards about 5 episodes, then called it quits. I’m AM an ardent West Wing lover though, mostly b/c I have a total woman crush on CJ Cregg. Yeah, I went there. PS. You called me out. I need to make my own tortillas. Stat. I’ve been wanting to try homemade tortillas for a while now. I’m having a dinner party on Saturday with a Mexican theme so what better time to give it a try? These look awesome! Question, I saw on your FAQ what camera and lens you shoot with but I am curious, do you use a tripod for your food photos? If so, do you mind sharing which one? Hi Jenna! These would definitely be perfect for your dinner party on Saturday! :) to answer your question – I have a tripod but I rarely shoot with it. The brand of my tripod is a Zeikos! I just love homemade tortillas, way better than store bought that’s for sure. I love how fluffy yours are! I had the same thing with House of Cards. I’m halfway thru episode 2 and haven’t gotten “hooked” yet, but I’ll be giving it another shot this week. These tortilla’s look amazing! Homemade doesn’t even compare to store bought. Yum! I’ve always wanted to try making tortillas! (and yes, I just sounded out Tortilla like Napoleon Dynamite). These are gorgeous!! These look so yummy and fluffy! I used to press these, at a Mexican restaurant I used to work at, with premade dough. I never knew how easy the dough was to make! Thanks for sharing! Glad to know someone else is on the Scandal bandwagon! Ohhhhh. I really need to make homemade tortillas! If you thought they were good with vegetable oil…next time try lard… I know it sounds off-putting to many people, but they elevate the flavor even more. Interesting, thanks for the suggestion! My husband started House of Cards last week & is already a few episodes into the second season – he is absolutely hooked. I’ve overheard a few episodes when he’s been watching, & i can tell it isn’t for me. He LOVED West Wing (he’s watched the entire series several times), so it’s right up his alley. Scandal & Nashville both hooked me in the first episode, but so did Downton Abbey – the characters were so intriguing to me. Another one that hooked me right away was Sons of Anarchy – LOVE. Two of my siblings are obsessed with The Walking Dead – we’ve finished the first season & are a couple episodes into season 2, & I think I’m too scared for it to keep me hooked lol! Homemade flour tortillas has been on my bucket list for so long and I still haven’t gotten around to it. I don’t know why – something is always getting in the way, but you’ve totally convinced me to try it SOON! Yum! I’m making these tonight and hope there is extra for some sprinkling of cinnamon and sugar. Try watching the show, Call the Midwives. It’s on Netflix and is fantastic! I hope you enjoyed this, Erica! Thanks for this recipe, I have been wanting to make homemade flour tortillas forever, but have been so afraid to try. I watched my mom try to make them growing up and they were a disaster! Tried the recipe last night and they were perfect, a new staple in our house! I’m so glad this recipe worked out for you, Laura! Homemade flour tortillas really make all the difference! Hi Leanne, I think it’ll work just the same! Wow I will definitely try these-they look gorgeous! I found your homemade tortilla recipe via Pinterest over the weekend and made them tonight for Cinco de Mayo. Thank you for sharing—they are to die for!!! I didn’t need all sixteen tortillas, so I’m going to try freezing them and see if I can use them later on. Have you had any success with that? By the way, I made these to go along with the Moosewood Restaurant Simple Suppers recipe for Spinach Cheese Burritos (to which I add pinto beans). Amazing. Haha, I’m so glad you guys loved this! I definitely love how soft they are!! i’ve made homemade whole wheat tortillas before and they were just OK. So I was a bit skeptical about this recipe. Because I didn’t have enough AP flour, I used 1 1/2 c AP and 1 1/2 c WW flour. They were fantastic! My hubby raved, and my 5-year-old ate two. So tender. This recipe is a keeper!! Yes! I LOVED how tender these were! 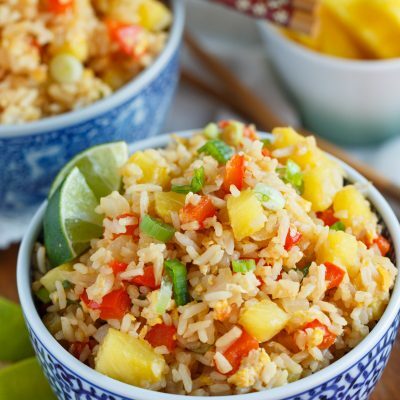 I’m so glad this recipe ended up being a keeper for you! these looked so good but they didn’t work for me I think it was the olive oil instead of vegetable oil… they were super dry. Yeah, next time, I’d suggest using vegetable oil like in the recipe! I think that might’ve been the issue too. Glad you figured it out. Thank you so much for this recipe, very easy to follow, learned as I went along how to roll out in circles. Tastes great, made baked and fried tortilla chips and steak quesadillas outta them!! amazing! I ate 7 out of the 16 tortillas. ? couldn’t get enough! This will become the permanent and ONLY recipe card for our tortillas. So happy I found it on Pinterest, the picture drew me in. Thank you for sharing! Made them today! They were really very tasty! And what I liked the most was the dough: so easy, soft and elastic to work with. And it is possible to roll out the tortillas incredibly thin without tearing them up. I used corn oil so my tortillas got even a touch of corn taste. With chicken shoarma, garlic sauce and tons of fresh vegetable: unforgettable snack! I am interested in using lard or Crisco, do you know how much I would use? I can’t wait to try this recipe. I would melt the lard or Crisco then measure 1/3 cup of it when it’s in liquid form. I just tried to make these and my dough was a bit stiff. I follwed your ingredients to the tee. When I heated them up,they turned into lethal frisbees? Any idea what i may need to do?Also does it matter about room temperature? I always have my hoise at 63F. What a bummer! I’m not quite sure what would make that happen, my only thought is that perhaps you overworked the dough. House temperature shouldn’t matter. We have our house temperature at 72.